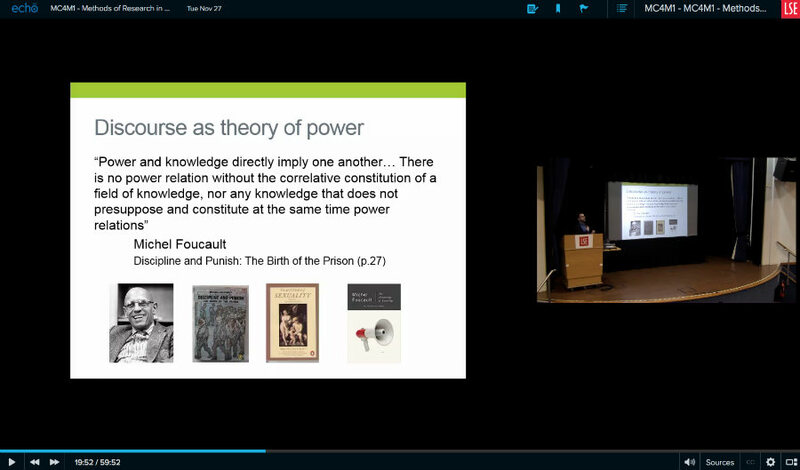 The LSE has a great system where shortly after a lecture is finished a video recording of the lecture along with the slides is uploaded to the learning management system (Moodle) as shown above. This may be common with all universities but is very different to my experience back in the 1980s. In addition to watching the video you can also download the audio as a podcast. Last week I caught up with some lectures using the video playback and I believe I actually learnt a lot more from watching the videos than I do from attending the sessions. I feel I pay more attention to what is being said and make more notes. Being in a lecture room with a few hundred other people can be distracting. It helps that I can sit comfortably, have a cup of tea and have the recording open in one window while I type notes in another. It also helps that I can pause the video and go back in time as I need. It is also helpful to be able to speed the video up, most of the time I run it at 1.25 speed which works well for me. Overall it seems that watching the lectures via video is very beneficial for me and it has made me question attending all the lectures in future. Last week I got back my formative essay grades and feedback. I was nervous as I haven't written an essay for over 30 years, though I have written extensively. The feedback on my first two essays was a very pleasant surprise. I think writing the essays well in advance helped, as did writing way too much initially as it made me edit to produce much tighter and well structured essays. I now think maybe I spent too much time on these formative essays, which are marked but don't count towards my final grade! I also worry I have set myself a high standard to keep up. I have completed rough drafts of two of my three summative essays and I hope to get the third done by next week. It doesn't look like I will get them completed by the time term ends but hopefully it will just be a case of editing over the holidays. Fingers crossed.